Famous Mark Verheidens Of Filmland: Original Art Friday!! For the last few months I've been quite busy producing the upcoming Swamp Thing live action series for the new DC streaming network, but that doesn't mean there hasn't been other nonsense on my mind. One of those nonsense bits is looking through some of the original comic book art I've collected over the years, in a feature I've been doing on Facebook called Original Art Friday. Knowing that not everyone is necessarily in the Facebook family, I'll start sharing those posts here as well. 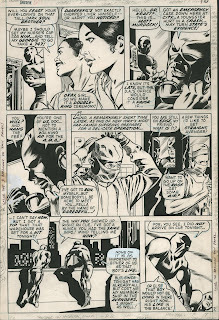 Today's piece is another beauty from one of my all time favorite comic book artists, Gene Colan, taken from issue #69 of one of my all time favorite characters, Daredevil, The Man Without Fear. 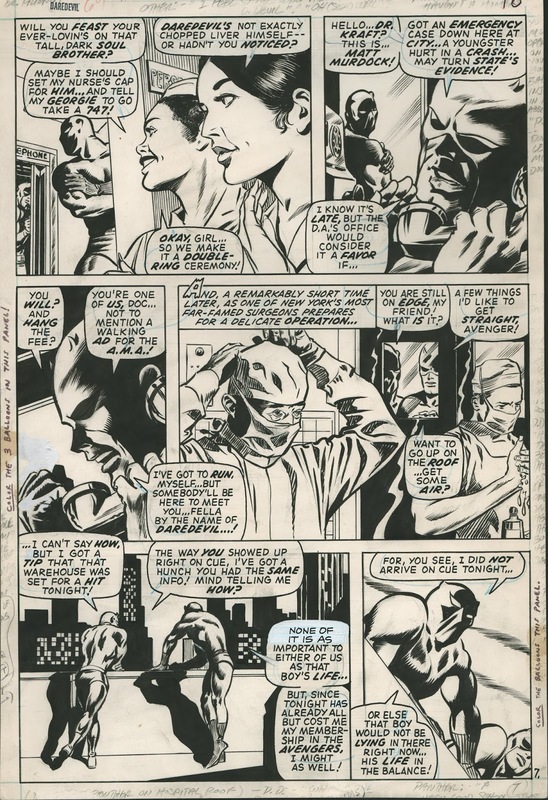 Here, Mr. DD converses with a certain Black Panther about varied and sundry (including the Panther losing a shot at joining the Avengers -- it's okay, pal, your movie did just fine) while some nurses admire their good.... deeds. It's not an action packed page and boy howdy there are a lot of words (as a reformed comic book writer, I apologize to artists everywhere for my verbosity), but it's still packed with angles, lovely figure drawing, and emotion conveyed through body language. I LOVE the panel with the Doctor in the center... even masked, you see the Doc's concern radiating. And remember this immortal line: "Daredevil's not exactly chopped liver himself --" Have truer sentiments ever been expressed?